If you are interested in sharing what you remember, please send a written story to Yellow Trail Museum; Burney Barn Story; P. O. Box 141, Hope, IN 47246. You could email those stories to Barb Johnson at hopesimmonsschool@gmail.com. You can also call the Yellow Trail Visitor Information Center at (812) 546-8020 or Barb Johnson at 812-371-7969. 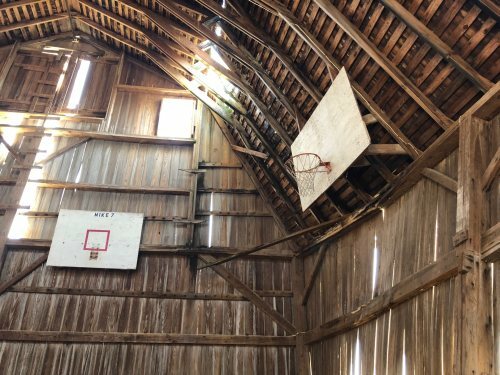 The Yellow Trial Museum is requesting stories related to basketball at Burney's Barn while hoping to hear several on Sunday, April 15th in the afternoon starting at 2 p.m. I had the pleasure of playing there. And, I feel close to the family with Dianne Burney Flack being a colleague for years. Recently, I had the opportunity to talk to John Burney, a former fifth grade student. John has this amazing memory for factual information. I can still hear him reciting all the presidents when in fifth grade. He mentioned an article about the barn in the 1982 JETSTREAM. I expressed an interest in writing a little about my experiences playing there and how the article would be of help. He gladly gave me a copy. Following, you will find some information from it as well as from John. John's grandpa, Clifty Burney, had the barn built in 1931 for a total of $1,000 with a loft that was intended to store hay. Times were tough back then for Dunlap's, and they were happy to have such a project. In 1932, half of the loft was turned into a basketball court. The court was 25' by 40' with goals at each end. In 1965, new goals were installed as well as a lighting system with the support of John's dad, Robert. The court saw a lot of players over fifty years of usage. In retrospect, this is an amazing story! I can't imagine offering such an arena in today's world thinking about all the possible issues, including liability insurance. John can't recall any serious problems with a high respect shown to the Burneys and the court within the barn's loft. There were just 3 rules: no horseplay; respect the property; no drinking or smoking. Jerry Bragg was quoted as saying, "Mr. Burney doesn't care if you play as long as you respect the barn and his other property." "No one is going to let a few people mess up everyone else's privileges of going out there," Russell Burton stated when asked about it. Mike Castetter said, "You don't have to worry about the goals being bent or the nets being torn." 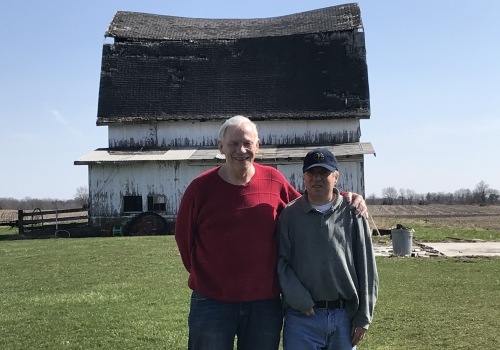 And, the article ended with Larry Clary expressing, "I think that everyone appreciates the barn and Mr. Burney for allowing us to use it." I remember Jerry, Russell, and Larry when at the Old Hope Elementary and still have the honor of seeing them now and then. John tells me that I missed Mike because he moved in later. I first came to Hope in the seventies and visited the barn several times. It is really hard to describe the uniqueness, the great atmosphere, and the specialness of it all. I recall Don Harris being one of the oldest players and sinking shots from the corner. David Green was one of the tallest players and had a soft touch around the basket. I always thought of him as a gentle giant and never wanted to upset him. Unfortunately, I left my very favorite brown leather hat in the barn one day and have not seen it since, never able to find one quite like it. Possibly, the barnyard dog took it! Unfortunately, there is no way to bring Burney's Barn back to life physically; however, there is a way to preserve the Old Hope Gym. I am sending money to the president of the Community Center of Hope, Jeff Yarnell, and would encourage all basketball players who enjoyed Burney's Barn Loft Court and the Old Hope Gym to do the same. It's for a wonderful community cause! I can see the excitement in all eyes now when young to old enter the renovated gym.